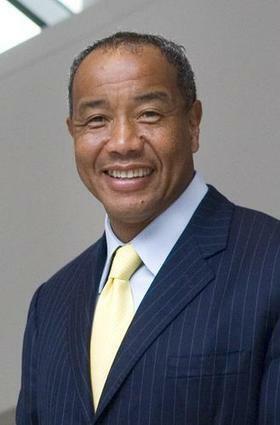 Michael Lee-Chin is best known as a business magnate, investor, and philanthropist. He is the founder and Chairman of Portland Holdings Inc., a privately held investment company which owns a collection of diversified operating companies in media, tourism, health care, telecommunications, and financial services. He is also currently Executive Chairman of AIC Limited (a Canadian mutual fund), and the National Commercial Bank of Jamaica. Canadian Business has named him as one of the richest people in Canada and estimates his wealth to be over CAD$2.0 billion. Lee-Chin was born in Port Antonio, Jamaica. Both of his parents were black and Chinese Jamaican. Lee-Chin is the descendant on both sides of his family of indentured Chinese workers brought to Jamaica in the mid-19th Century. When Lee-Chin was aged seven, his mother married Vincent Chen, and they had seven children. Lee-Chin’s mother sold Avon products, and worked as a bookkeeper for various local firms, while his stepfather ran a local grocery store. He attended the local high school, Titchfield High, between 1962 and 1969. In 1965, Lee-Chin at 14 worked as part of the landscaping team at the Frenchman’s Cove Hotel. One year later he got a summer job working on the Jamaica Queen cruise ship, cleaning the engine room. In 1970 he went to Canada on a scholarship program sponsored by the Jamaican government to study Civil Engineering at Mc Master University in Hamilton, Ontario. After graduation in 1974 he returned to Jamaica and worked briefly as a road engineer for the Jamaican government, but unable to find work in his field, he returned to Canada. At first he worked as a bouncer, making $2.50 hour but later found employment as a financial advisor for Investors Group in Hamilton, Ontario. In 1974, he married Vera Lee-Chin, a Ukrainian Canadian whom he had met at McMaster University. The couple had three children: Michael Jr., Paul, and Adrian. They parted in 1991, and officially separated but never divorced. Ms. Lee-Chin has since contested the terms of the separation agreement, claiming Lee-Chin did not disclose their actual wealth at the time of the separation. Lee-Chin now lives with Sonya Hamilton, with whom he has fraternal-twin daughters Elizabeth and Maria, in Burlington, Ontario, and Miami Beach, Florida. In 1979, after leaving the Investor Group Lee-Chin became regional manager of Regal Capital Planners Ontario, Canada. While at the company, in 1983 he secured a loan from the Continental Bank of Canada for C$500,000 to purchase a stake in Mackenzie Financial Group and to form Kicks Athletics with Andrew Gayle. By 1987, the investment was worth C43.5million. In 1987, he took the proceeds from his Mackenzie investment and brought Advantage Investment Council for $200,000. At the time, the company had holdings of around C$800,000. He renamed the company AIC, and by May 2008 developed it into a fund that managed approximately C$6 billion. Lee-Chin set up the Berkshire Investment Group of companies in 1991, comprising an investment planning arm, a securities dealership, and an insurance operation. By 2007, the Berkshire Group amassed more than C$12billion in assets under administration. The same year Manulife acquired Berkshire from Portland Holdings in exchange for shares, making Portland one of the largest shareholders of Manulife. In 2009, Lee-Chin sold AIC Limited to Manulife for an undisclosed amount. Chin is also a philanthropist. In 2003, he made headlines when he donated $30 million to the Royal Ontario Museum (ROM). He also provided a $10 million gift to the Rotman School of Management at the University of Toronto. The gift established the Michael Lee-Chin Family Institute for Corporate Citizenship at the University of Toronto. Michel Lee-Chin also currently sits as chancellor of Wilfrid Laurier University. “Rich 100 2014 full List: the complete List of Canada’s 100 Richest People,” Canadian Business, January 9, 2014 (http://www.canadianbusiness.com/lists-and-rankings/rich-100-the-full-2014-ranking/); Christopher Helman, “Get Rich Slow,” Forbes, April 15, 2002, http://www.forbes.com; Denise Williams, “Michael Lee-Chin- Every mickle makes a muckle- The acquisition,” Jamaica Gleaner, February 6, 2004, http://www.jamaica-gleaner.com.